The feel good story of the night, and maybe one of the feel good stories of the last couple years, turned into one of the most disappointing and heartbreaking stories of recent memory on Saturday night at South Georgia Motorsports Park. Randy Gentry, one of the good-ole-boys of racing, found himself in the lead in Saturday night’s event with just a handful of laps to go. First- and second-place Shane Huffman and Mark McFarland had got together and slid up the track, which opened the door for Gentry. Gentry pulled out to a large lead before Huffman could regain control of his car and Gentry looked to be on cruise to his first career Pro Cup win. The emotions of losing a race were tough on Gentry, especially as his car coasted to a stop. Randy Gentry wasn’t the only driver close to winning on Saturday night. So was young Mark McFarland. Then, a late caution came out, bunching the field back together. It spelled doom for former All Pro Series regular. As Gentry led down the backstretch, getting ready to take the green for a two lap shootout, his car began to smoke and slowly came to a stop. He went from leading the race and a near definite win to finishing 15th. “We’re just sitting there and we’re fixing to take the green-white-checkered off the restart,” said a disappointed and distraught Gentry after the race. “I was going to clean the tires off for the last time and something just popped underneath (the car). We were just sitting there cleaning the tires off and I don’t know what happened. I didn’t gas it up or anything. I don’t know. McFarland, while not an official Pro Cup Series rookie (he’s run too many Craftsman Truck and Busch races to classify as a rookie), continued the charge of the new talent in the series, picking up the pole and leading the race’s first 103 laps before leading the entire field onto pit road for their one and only round of stops. McFarland’s JR Motorsports team (owned by Nextel Cup star Dale Earnhardt Jr.) had a bad stop and got McFarland out fifth, forcing him to have to come through the field to get back to the front. When he got there, he met a fierce competitor in Shane Huffman. times, each time with Huffman coming out on top by using the upper groove. The last side-by-side battle, with the two jockeying for the lead with just five laps to go, proved costly for McFarland. 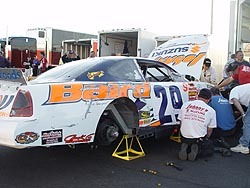 The two bumped, which eventually cut down McFarland’s tire and caused him to have to limp his way around the track, out of contention and on to a ninth-place finish. “We had a good car,” said McFarland, a former NASCAR Weekly Racing Series National Champion. “We lost a few spots on pit road and that is understandable. That was our first full pit stop as a team. We were real good on long runs. It took us a while to get going. “We were just going for the lead under Shane. It is real hard when you are on the bottom to complete the pass. You can get under them, but it gets real loose on the bottom. The high groove is really easy. If I was out front they wouldn’t have seen us. “Right before that, the plug wire had burn off the number one cylinder, so we were running off of seven cylinders. But I don’t know if there was contact there or not. The BFGoodrich guys said they thought the tire might have went down because of brake heat. But it was Rogers who added his name to the list of heartbreaks on Saturday night. On lap 210, while riding comfortably out front, Rogers’ right front tire blew going down the backstretch, sending him into the turn three wall hard and knocking him out of the lead and out of the race. He finished 20th. The champ now finds himself seventh in the point standings. The Pro Cup race on Saturday night was the first event in the history of South Georgia Motorsports Park’s half-mile oval. The track, which will run weekly shows, opened in front of a packed house with what many consider the best short track series going right now. The drivers gave it praise. South Georgia proved that being in the lead wasn’t the best place to be. The early race leader, and perhaps the guy with the best car of the night, Mark McFarland, had problems. Then late race leader Randy Gentry broke under the caution. Clay Rogers’ luck wasn’t any better. Rogers, the defending Pro Cup Series National Champion, led following a round of pit stops for 103 laps and looked to be the car to beat over the late stages of the race. Even eventual race winner Shane Huffman said he had nothing for Rogers. 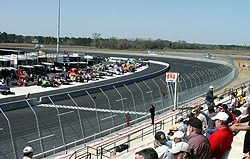 The permanent concrete grandstands at the track supposedly hold 3,000 people. The track also brought in 3,000 more temporary grandstands for seating for the Pro Cup event. Even then, there were plenty of people that were left standing to watch the event. The South Gerogia Motorsports Park is a beautiful facility and the drivers loved it. And they got to see a good one. 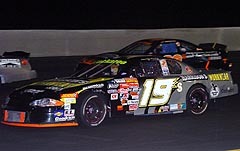 Winning the Southern Division Rookie of the Year in 2004 was huge for Brad Rogers, brother of champion Clay. He proved himself just as good and proved that he’d be a legitimate threat for the 2005 Pro Cup Series National Championship. Now though, those dreams are fading fast, as Rogers is sitting on the sidelines, a victim of the strict economy and its crossover into racing. After racing in Lakeland, Rogers was sitting out South Georgia in his family-owned number 29. The team loaded the car up, but then got it back out and made the repairs to Brad could still start the race, which is did. He pulled in and retired after just two laps. Rogers is hoping someone will still step up and sponsor his ride for the regular season so he can still be a threat for the title. If anyone is interested in sponsoring Rogers, they can get a hold of him at 704-562-9489. Steve Wallace had about the exact opposite of day in Georgia than he did in the last race at Lakeland. Brad Roger's ran brother Clay's backup, but bounced it off the wall during qualifying. “It’s money. We are just trying to save money,” said Rogers. “We are running a limited deal so we can get into those last five (the Championship Series) and so we can race those right. We learned last year that you don’t have to be good in every race, you just need to be good in the last five to make a little bit of money. 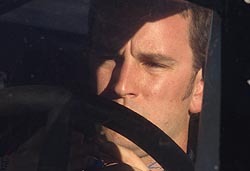 But at South Georgia, brother Clay stepped up and offered up his backup car for Brad to qualify and start the show with, to at least get last-place points and a little bit of cash. It was a good plan, until qualifying came around and Brad side-slapped the wall on his first lap, causing extensive damage to the car. Wallace qualified in the fourth position for Saturday’s race, and in doing so, he was the highest qualifying rookie in the field. 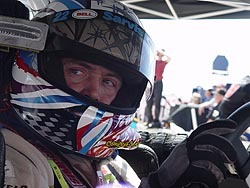 However, immediately after rolling off from the grid, Wallace found his steering wheel to be improperly attached. He stopped on the front straightaway to reattach the wheel, which is a no-no according to the Pro Cup rulebook. Officials found this to be in violation of race procedure rules and forced Wallace to start from the rear of the field. However, Wallace would not remain there long, as he stormed from 35th position all the way to 14th before the engine in his Dodge failed on lap 34 of the 250 lap event. Steve Wallace had a short night. “We really had a heck of a race car today,” said Wallace. “It handled like it was on a rail. It’s a total shame that we had the engine trouble, because I think we really had something for them today. “I don’t know what’s going on in the engine department right now. That’s the second engine we’ve lost this year. Maurice Petty has never built us anything but really strong and reliable powerplants, so I’m sure that they’ll get it straightened out soon. Jason Sarvis probably had dreams of repeating his 2002 season when he returned to the Pro Cup Series in 2005 on a full time basis. That is when he was the series champion. 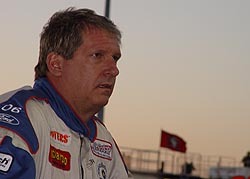 Bobby Gill was one of the few drivers that didn’t test at South Georgia Motorsports Park. And while he even said that his car wasn’t great during the race, he still came home with a third-place run on Saturday night. But 2005 has been anything but easy for Sarvis. After lots of struggles in Lakeland, the team came to Georgia looking for good things and it started well, qualifying his #16 on the outside pole. But it didn’t last, as Sarvis fell victim to a flat right front tire during the race and pounded the outside wall, ending his night and leaving him with a 25th-palce finish and 15th in the point standings. Gill was right in the thick of things in the wild last two lap scramble. With his car already beaten and battered after a couple of other run ins earlier in the race, Gill jumped underneath Shane Wallace to grab second on the final restart. However, Gill got passed by Andrew Rogers and fell back to third as the checkers waved. Sometimes, just being a rookie brings on bad luck. 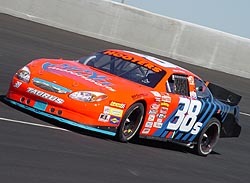 USAR Hooters Pro Cup Series Rookie of the Year candidate Chase Pistone will attest to that. For the second race in a row, Pistone looked to have one of the best cars of anyone at the track, but the bad luck cloud followed him around the half-mile South Georgia Motorsports Park, relegating him to a 24th-place finish. When I was pulling back out of the pits after serving my penalty, my car started spitting and sputtering. “It ended up that the battery was going dead in it. We pulled in and changed the battery but lost some laps. We went back out and then got a flat left front tire. “Our race went bad from about lap 150." George Brunnhoelzl didn’t have a great car on Saturday night, but he didn’t have a bad car either. They are just looking for that little extra bit to push them over the top. 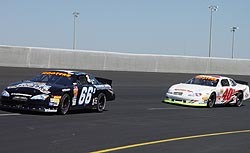 Chase Pistone (#40) chases down Steve Wallace (#66) during practice. The finishes in no way reflect how strong Pistone has run. Saturday night in Georgia, the rookie followed up his pole in Lakeland by qualifying sixth and running in the top-10 much of the night before the first round of pit stops just past the 100-lap mark. His FastTime Motorsports team got him out third, but then the bad luck gremlins showed their faces. “We were running sixth or seventh and came out of the pits third, but my rear tire carrier got hit. He dropped the tire and I took but, so (the officials) made us come in because the tire was left on the wrong side of the car. “We missed on set up. We had a good car in practice. We missed the set up though in time trials. At that start of the race, we missed that. We have to learn these tires. The car is changing too much between day time and night time. We don’t know how to compensate for it yet. We are better than we have been, but not where we need to be yet. I kinda screwed up and cost off a couple of spot by passing the pass car when I was getting into the pits. It was Brunnhoelzl’s first race with new sponsor Tucson. He finished 12th. Never give up. That is an attitude that Mike Garvey has when he is at a race track and that is the attitude that could lead him to a Pro Cup Championship in 2005. Garvey once again showed his savvy on Saturday night. After a great second-place run to open the season in Lakeland, Garvey and the Jani-King bunch lost a brake line early in South Georgia. But rather than park his ride, Garvey and his team made countless stops to repair the faulty fitting and finished 19th. It was not a good day all around for the crew. The problems started in practice. “During practice, we broke the bolts off the ring gear. They just sheared off. What do you do? I don’t know how to stop stuff like that. We’ll just go to the next race and see how we can do. Shane Wallace had a great run going, running second during the last restart, when his night went to crap. Jay Fogleman was pretty happy that he and his team salvaged a fourth-place finish with an ill-handling race car, but wasn’t very happy with the way he was treated by the rookies, specifically one of them. Fogleman and Rogers got into it during the last restart madness. But despite all of the beating and banging, Fogleman was still happy with his top-five. “My guys worked and worked and worked to get my car freed up. They did a super job at keeping us on the lead lap. 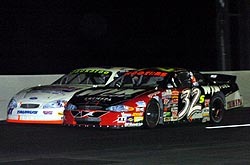 We were fighting the car all night long for a fourth place finish. We got it better, but we were just tight all race long. “We lost two cylinders about lap 200 and we were able to hold it wide open. I bounced the car off the wall one time and hurt it a little bit. Beside that, we ran very well. Wallace was able to limp his heavily smoking car around the track, but came home with just an eighth-place finish, a far cry from how well his car ran all night long.